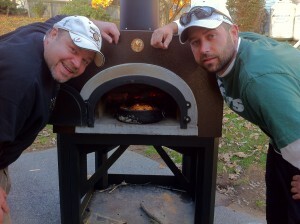 What CAN'T you cook in a Wood Fired Brick Oven? Well, after weeks of Sunday experimentation with pizzas cooked in a Chicago Brick Oven, we know that you CAN cook pizza. I spent quite a few Sundays with Joe Mishler, Executive Chef at Devon Seafood Grill in Hershey, PA. Together we went on a culinary journey to explore what all could be accomplished on one of these Wood Fired Brick Ovens. With a bit of creativity, imagination, and just a few ingredients, we spent days coming up with many variations of what could be called pizza, from simple and traditional to gourmet, each one better than the last. We started basic, but the results tasted so good that we quickly got bold with our combinations and turned our backyard into an open air gourmet kitchen! We started with Margherita pizza (dough, sauce, mozzarella, basil, and spices), and ended up at BBQ Chicken Pizza and Seafood Pizza with shrimp & scallops. After discovering what all kinds of pizza we could create in this wood fired oven, I think the words “take-out” and “frozen” will leave our vocabulary, at least when talking about pizza! You can only eat so much pizza, so we soon began experimenting with what else we could cook in our oven. Pork, Chicken, Seafood, Lamb, Beef, Desserts; the sky was the limit! Soon enough, our Sunday gatherings started to grow and we had progressed to serving up dishes like garlic infused flat iron steak, baby back BBQ ribs, whole pork tenderloins and herb crusted lollipop lamb chops. Desserts included cherry cobbler and peach cobbler pizza topped with mascarpone cheese and drizzled with honey. So after weeks of cooking, we can’t really answer the question of what CAN’T be cooked in a Wood Fired Brick Oven. What we discovered was this: If it can fit through the door of the oven, you CAN cook it! Watson Supply is the PA distributor of Chicago Brick Ovens. If you are interested in learning more about these ovens and this incredibly versatile method of cooking, please give us a call at 717-238-9730, and one of our experts will answer any questions you have.